As thousands of Puerto Ricans rejoiced in New York City this weekend for the annual Puerto Rican Day Parade, many flocked to stadiums across the country to watch professional baseball games. The Commonwealth that has produced such greats as Hall of Famers Roberto Clemente, Orlando Cepeda, and Roberto Alomar, should offer a tip of the cap to a pioneer that opened the door for these talented names to follow. Five years before Jackie Robinson, Hiram Bithorn blazed new pathways in major league baseball. 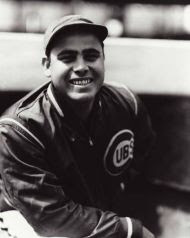 Suiting up with the Chicago Cubs on April 15, 1942, he became the first Puerto Rican in MLB history. Born March 18, 1916 in Santurce, Bithorn excelled in athletics from a young age despite missing his right big toe. In addition to starring in baseball, he represented Puerto Rico in basketball and volleyball at the Juegos Centroamericanos y del Caribe (Central American and Caribbean Games) in 1935. Bithorn made his 1936 debut in organized baseball with the Class-B Norfolk Tars of the New York Yankees organization. He moved up the ranks playing for Norfolk and Binghamton before moving to the Yankees AA Newark club in 1938. This season proved to be an important one for Bithorn in more ways than one. Already a star in the Puerto Rican winter leagues with the San Juan Senadores, Bithorn created history of his own there, making his mark as the youngest manager in league history at the age of 22 that winter. Returning with the confidence of managing his own club, Bithorn moved to the veteran laced Pacific Coast League in 1939, playing with the Oakland Oaks. He had a 13-14 record and spent the following two seasons playing with Hollywood, posting 27 wins during that span and drawing the attention of the Chicago Cubs scouts. He was purchased from Hollywood at the end of the 1941 season and was quickly inserted into the Cubs pitching rotation at the start of 1942. He went 9-14 pitching in 38 games, starting 16 of them. Lennie Merullo, the shortstop on the 1942 team, had clear memories of Bithorn’s acquisition. Bithorn’s value would manifest the following season when he was 18-12 with a league leading seven shutouts in 249 innings. Merullo explained how Bithorn's control was the key to his success that season. As a Latin player on the Cubs, "Hi" as he was nicknamed by reporters, wasn’t alone in his journey. The Cubs brought in Cuban catcher Chico Hernandez to work with Bithorn. Hernandez played both the 1942 and 1943 seasons alongside the trailblazing Puerto Rican. They were only the second Latino battery in major league history. The duo was well-liked in the clubhouse. Bithorn’s playful nature allowed him to roll with the ribbing he received from his teammates. Just as Bithorn’s career was beginning to take off, he was summoned by Uncle Sam to serve in the United States Navy. He served at the San Juan Naval Air Station beginning in 1943, where he was player-manager of the base team. Discharged just short of two full years of service, Bithorn eagerly anticipated his return to the Cubs. Just before returning to the United States, Bithorn injured his hand during a winter league game. This delayed his return to the Cubs, and when he got back, he couldn’t recapture the enchantment that made him so special before entering the service. He went 6-5 in 1946, primarily in relief, suffering from what was believed to be arm problems, weight gain and a possible nervous breakdown. He would pitch two more innings in the major leagues in 1947 with the Chicago White Sox and then never return to the big leagues. He unsuccessfully tried a comeback at the AA level in 1949, and retired as a player following the completion of that season. Bithorn’s history is sealed in as much as his debut, as his tragic death. On December 30, 1951, Bithorn was shot by a police officer in Mexico after a dispute over selling his car. The officer, Ambrosio Castillo shot Bithorn and then drove him 84 miles away to the Ciudad Victoria hospital. Bithorn died shortly thereafter. Doctors claimed that if Bithorn had been treated earlier that he might have lived. Castillo was convicted on homicide charges after his version of the dispute didn’t hold up in court. At age 35, one of Puerto Rico’s heroes was laid to rest in his hometown only after his body was exhumed from an improper burial in Mexico. Ten years later after his burial in Puerto Rico, their largest baseball stadium was renamed Estadio Hiram Bithorn in his honor. The stadium, which is home to the Senadores, was also the home of the Montreal Expos for the 2003 and 2004 seasons.